High-impact violent events are a major problem in Honduras. Kidnapping, extortion, threats and assault occur daily, having a significant impact on the population. Médecins Sans Frontières/Doctors Without Borders (MSF) is in the country providing mental healthcare for survivors of various types of violence. In 2016, we expanded our activities in the Honduran capital, Tegucigalpa, and its sister city Comayagüela. “We are talking about people who have suffered directly from these violent acts,” says MSF mental health supervisor Edgard Boquín, “but also about the relatives of those affected. In 2015, our teams provided mental healthcare to 158 patients who had been victims of this kind of violence, but in 2016 the number jumped to 340. This is an increase of 117 percent. Given the extent of violence within Honduras, our teams estimate that there are many more people in need of support. “We know that this is just the tip of the iceberg,” says Edgard. In Honduras, violence is so commonplace that it is an everyday occurrence. As a result, people often ignore the consequences of violence. They fail to recognise the impact it has on their lives, both in the short and long term. 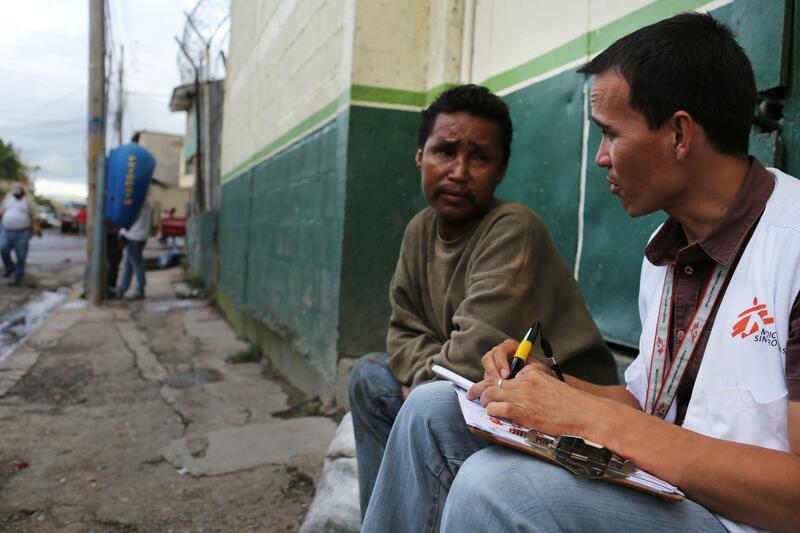 A group counselling session run by MSF's mental health team in Honduras. People’s reactions to violence vary, with some more resilient than others, but many are left struggling to get on with normal life. “These events can be very traumatic and stop people from functioning normally,” says Edgard. “Some symptoms appear very fast, such as acute stress, which manifests in feelings of anxiety. "Some people have serious difficulties with their sleep patterns, including insomnia and nightmares. Our teams provide support to help people prevent their symptoms from turning into something more serious. Our mental health teams provide individual sessions, group sessions and activities such as psychosocial workshops. Most patients attend between one and eight sessions in total. “We try to work on the emotions, feelings and thoughts that people experience as a result of what happened to them,” says Edgard. “We use also use cognitive behavioural therapy. "This helps patients take the detrimental elements to their emotions, feelings and thoughts and replace them with positive coping tools, such as anxiety control, breathing and relaxation techniques. Our teams also provide patients with information about other types of assistance available to them. This includes refuges, relocation to other parts of the country, social protection and legal advice. Our experience shows that the more external support people have, the better their chance of recovery. Art therapy for survivors of violence in Honduras, run by MSF's mental health team. “Patients can leave the clinic with a clear notion of how to improve their mental health," says Edgard. "But if every day they face a threatening situation, with no way out, then it’s far more difficult for them to recover. Since 2011, we have been providing our ‘servicio prioritario’, or priority service, in collaboration with the Honduran Ministry of Health. This service offers emergency medical and psychological care to victims of violence, including sexual violence. This free, confidential, one-stop service is available at two health centres and in Tegucigalpa’s main hospital.